My conclusion is that reMarkable team delivers on their promise, to create a true paper tablet. The device delivers better paper and has replaced my Leuchtturm journal. I use more digital paper than I ever used offline paper, I no longer refrain from getting a “dead” copy as a PDF to draw, doodle and ponder upon. It is a reMarkable device, yet with some quirks to overcome; I have found workarounds to each of my quirks so far, especially one where notes were not visible on the device due a redrawing issue, yet still visible on the computer and iPhone. Let’s hope for a software update soon! 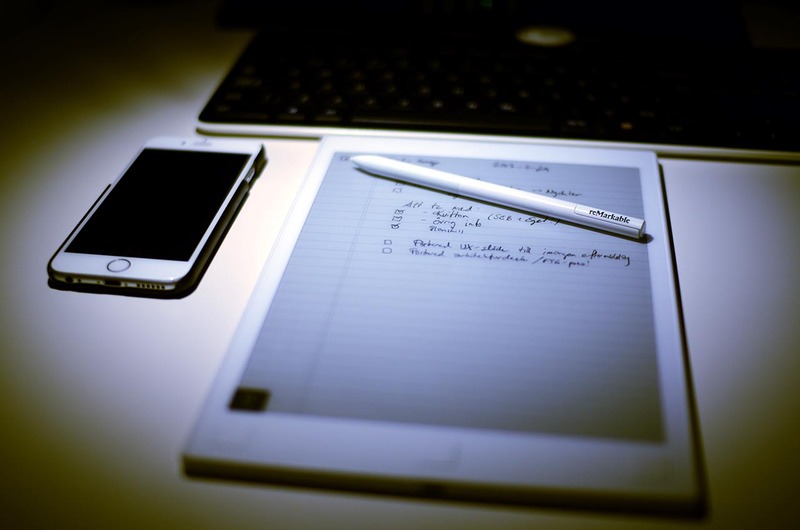 What’s great about digital paper? Top three features include to have the possiblity to annotate PDFs and other materials without printouts, to work more effectively with my journal with easily accessible “notebooks”, and finally the comfort of both continuous backup and pin code protection of my notes. I actually don’t know the breaking point between using paper and the paper tablet from an environmental perspective. The knowledge however that I used up an excess of 600 double pages of paper per year just to keep my journal makes me at least feel somewhat better in avoiding the use of all that paper. The fact is that I now use more of digital paper than I used offline paper in the past; a testament of the effectiveness of the device. I use it to annotate PDF:s, blankslide slide decks (to draw the draft on paper), use the notes view which I didn’t in the past, proofread with paper instead of on the screen, returned to pen based weekly planning. To be able to switch between notebooks is extremely helpful. I previously held an index of all my notebook notes as a few pages in the beginning of each journal. Now that section is in a different “file” on the device, making it easy to switch between them when needed. I chose to not use multiple journals in the past, due to weight restrictions. Digital paper has only the fixed weight, not the per page weight, which adds a lot of benefits. When I say I keep an index, it’s about recording every note I take with a unique sequence/page number, name, date and “tag”. To keep an index makes it easier to get back to the exact page of a note quickly. I number the pages in each notebook ahead of time, and use the notebook number together with a page number. Keeping 100 pages per notebook means that notebook 11 page 45 has sequence 1145, which I can use as a unique reference in every medium. Keeping an index transformed my journal keeping experience. Thanks Gary for teaching me this indispensable nugget of wisdom! What I have learned with the index, and that didn’t work well for me before switching to the reMarkable, is to annotate the notes as done and keep track of the done status in the index. That way, I know that all my notes get processed. It’s a great way to ensure nothing is missed and comes with reduced anxiety! I don’t like books with notes in them, yet I think and remember better when writing out the notes myself, something I refrained from in the past. Using layers in the paper tablet, I can hide the notes when I feel they are ugly, and see them when I want them there. I get to solve that unsolved loop for myself. Using the computer or the iPhone and used the synced notes, I can view the notebook/journal pages and more easily update my index. and look at multiple parts of my handwritten notes, drawings etc. at once. There are quite a few templates built into the device. Weekly planning, perspectives, more or less dense lined paper, dots and grids, storyboards, schedules and more. The paper I use the most, and that closely mimics the Moleskine I used to use is the margin small template with 33 lines and a big heading line (equivalent of 3-4 lines). The resolution is enough and mostly invisible, making it possible to jot down in my small handwriting and keep the text neat still. Most other tablets with pens, such as the iPad, Surface etc. simply do not have the same tactile feedback and renders my drawings and text much more poorly. I found some additional information that extra templates can be added/hacked into the device. For everything good, there are improvement opportunities. For the reMarkable, this holds equally true. I must say though, there are fewer than I had expected. I feared that the missing pages which I encountered twice or thrice were data loss issues. I have since learned that there is a screen redraw issue that cause newly written pages to go missing sometimes. There is an easy fix though, to make the current layer invisible and then visible again. It makes the paper tablet redraw the page and then include the text again. Also, sometimes the template setting gets lost and you need to reconnect the template when it happens. I hope they fix this with the next software update, it worried me a lot and caused diminished trust in the experience until I figured out the fix! I had since long invested in a USB extra battery for my devices, most notably the iPhone which no longer lasts a day on heavy use with Skype teleconferences over data. The reMarkable unfortunately lands in the same category in intense meetings (writing more or less constantly for hours). It is seldom I use up the battery, but a situation worth preparing for until fixed. This has been acknowledged and promised to be fixed in the next update. You need to have a standard home-style Wifi access point setup, with WPA or WPA2 encryption. The device neither supports web-login-based Wifi such as many public hotspots, nor more advanced Wifi protection such as EAP, as long as Wifi is configured through the GUI. There are instructions available online with how to hardcode the WPA Supplicant on the reMarkable though. For me, the iPhone internet sharing works well enough while on the go. If used, you may need to monitor your bandwidth usage! One more thing I hope they fix is that it seems the entire notebook is often uploaded on every sync. The bigger it is, the more time it takes to transfer. To keep notebooks to a 100 page maximum seems to be a good choice of size for me, to make them quickly syncable. I hope that they will support Bluetooth tethering with the iPhone or computer in the future which would mean I would worry less about sync as it could remain tethered constantly. There is no mention whether any connectivity other than Wifi will be supported. Maybe the bluetooth wish will never materialize. We can always hope for it though. The paper tablet has the large page flipping buttons on the bottom left and right. I sometimes manage to flip the buttons accidentally when taking notes. Having the option to have the device upside-down, with the buttons on top, would be most helpful when writing. And then switch back to regular button locations when reading. It would be a nice touch, and not a dealbreaker. I had hoped for a bit more durable nibs. I use up one in about one and a half week’s heavy (!) use, which means I will need a few nib packs per year. The cost is about a quarter or a fifth of what I spent on writing gear in the past so not that much. I think that should be a very reasonable price to pay for digital paper, yet something to be aware of! With the caveats of the missing page refresh (most important nuisance), the battery issue (hope to get at least two days) and to only be able to sync over (some) wifi are my most important concerns. With those resolved it will be a truly great device. All three issues depend on software which means I expect them to be resolved. Until then, with all the benefits, the reMarkable paper tablet is still a lot more than I had even dreamt about. I don’t expect to go back to paper anytime soon.